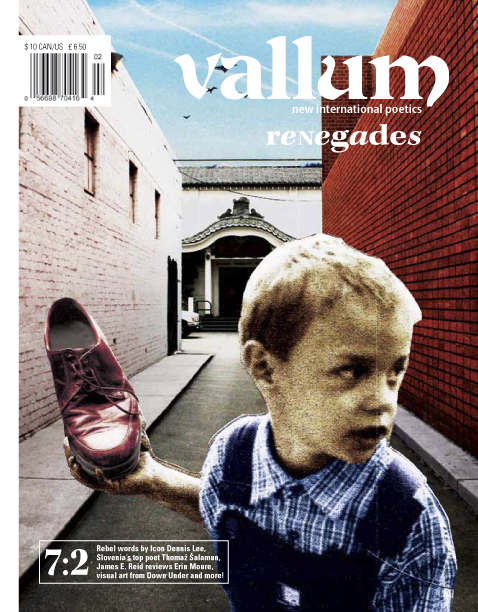 Issue 7:2 of Vallum, “Renegades” is now available in stores! Check out additional online content; listen to poets read their work from the issue on our website. We plunge forward, often with our eyes closed, not knowing what is in store for us. Realities unfold, dreams are realized or fail to materialize. Many possible futures are on the verge of happening. What do we have to say about the time that has yet to come, the future(s) of this world? This upcoming issue will also include a special section on “found” and “overheard” poems. Vallum is proud to present two new additions to the Vallum chapbook series! Don’t miss the latest event in the Vallum Poetry Reading Series, featuring Larissa Andrusyshyn, Ilona Martonfi, Harold Hoefle, and Nelly Roffé, with music by John Kerkhoven and Patrick Hutchinson. Larissa Andrusyshyn recently completed a master’s in creative writing at Concordia University. She co-ordinates writing workshops in outreach schools and works at a veterinary hospital. Her work has appeared in CV2, Headlight, The Future Hygienic (Pistol Press 2009) and Rogue Stimulus (Mansfield press 2010). Her first book of poems, Mammoth, was released by DC Books this spring. Nelly Roffé has translated two books of Mercedes Roffé’s poetry published by Le Noroît, Rodolfo Häsler’s “ Tête d’ébène” ( Barcelona) by Les Écrits des Forges, Pura Lopez Colome’s “C’est l’ether” (Mexico), and a play by the young Mexican author Humberto Perez Mortera , “La dernière aventure de Poderoso.” Roffé gives also conferences on North African literature, poetry of exile, the Inquisition, woman and literature, and recently on tango at University of Quebec. She has participated in the writing of several anthologies of sephardic literature and has been granted bursaries for research in Madrid, Granada and Banff. She is now writing her own poetry. Harold Hoefle‘s short fiction has been published in numerous journals, and his non-fiction won an Honorable Mention at the 2006 National Magazine Awards. In 2008, his novel The Mountain Clinic was published by Ottawa’s Oberon Press; last year, the novel was a finalist for the Paragraphe Hugh MacLennan Prize for Fiction, sponsored by the Quebec Writers’ Federation. Most recently, his short story “Reception” won 1st prize in the Carleton University Literary Contest. John Kerkhoven is a writer, editor, and document designer who has been blowing harp and singing on local stages for a few years with no intention to stop. Patrick Hutchinson has been playing on the Montréal scene for nigh on three decades and is currently, among other things, one third of Swift Years who have a soon-to-be-released fifth CD.